Out of the billions of page views Outbrain powers each month, how can you be sure that you’re reaching the right audience at the right time? 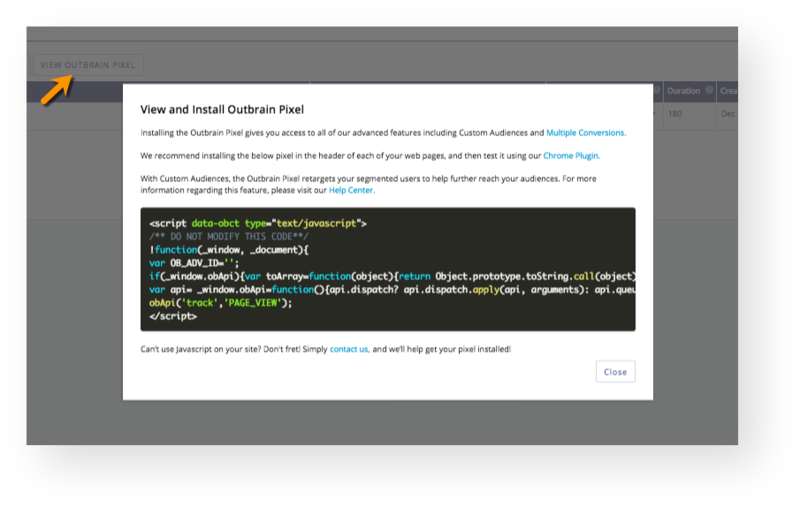 Our Custom Audiences feature makes it a cinch to segment customers by their actions and retarget them with new or existing campaigns. This allows your campaigns to reach a highly engaged audience that is more likely to convert and fulfill your brand’s goals. Depending on your strategy, you’ll be able to segment customers in three ways: Audience Retargeting, Story Sequencing, and Converters Segment. Not sure what those status messages mean on your segments? We have them all in our Segment Overview. You can also import your own 1st Party Data if you have an account with our partners. You can find the code by clicking “View Outbrain Pixel” in the overview page. After installing, you can choose which kind of segment you wish to set up. Click “Add Segment”, and enter in the segment name, an optional short description, and a cookie window duration between 1 and 180 days. Now you can choose which type of segment works for your campaign goals: Audience Retargeting, Story Sequencing, or Converters Segment. If you are looking to create a pool of users that have visited a certain page or a combination of pages on your website, Audience Retargeting is for you. Depending on the and/or URL conditions, you can create a pool of readers who meet a certain pattern. Begin by setting up the first rule using any of the statements in the drop down menu. You can also click the +And/+Or buttons to add in another statement. If you would rather retarget those who have viewed an Outbrain campaign in the past, choose Story Sequencing as your Collection Type. In a nutshell, Story Sequencing enables you to serve a sequence of content to the same reader, guiding them through different stages of the reader’s journey or educating them about different aspects of your brand. If you are selling a product, try running editorial content first, then retargeting those who clicked using your product page. Click on Story Sequencing as your Collection Type and enter in the campaign name(s) you wish to target. If you’re tracking conversions in your campaigns, you may want to retarget those who have converted in order to re-engage with them. You can do so by selecting Converters Segment as your Collection Type. This will create an audience consisting of any user who has converted on your site (even if the conversion didn’t come from us!). In addition, the Converters Segment supports all types of conversions, Event based, URL based, and even Server to Server based. Need a refresher on how to create conversions? Take a look at our guide. Click on Converters Segment as your Collection Type and enter in the conversion name(s) you wish to target. After you have created your segment, hit “Save” to view the overview page. Please note that in the case of Server to Server based conversions (such as mobile or app downloads), the Converters Segment will only collect conversions that originated from Outbrain. Waiting for Pixel : Check that your Outbrain Pixel is firing correctly by testing the conversion action or waiting for the conversion to occur. You can also use our Pixel Tracker to test your Pixel. Active: The Pixel is firing correctly and the Segment is currently collecting new users. Click on “Test” next to the status at any time to test its implementation again. You can also make changes to the segment by clicking the pencil icon next to the segment name. Note that changing the URL will affect the pixel status. Disabled: The Segment has been manually deactivated. Segment Not in Use: The segment is not in use and is not populating with users. 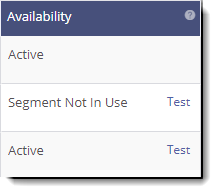 Segments will automatically be marked as ‘Segment Not In Use’ if they are not being used for any active campaigns or if they haven’t been used for an extended period of time. In order these segment to be active, simply target them to an active campaign. Segment Size Exceeded: The segment is over the maximum size and will not populate with new users. Now that you’ve gotten a few segments set up, head to your main dashboard to add these segments to existing campaigns. When viewing your campaign settings, you’ll notice a more robust “Targeting” section. Here, you can include and exclude segments by popping the name of the segment into each respective field. Note that you will only be able to target up to 50 campaigns per segment, but you can exclude up to 100. The Potential Reach estimator will only account for the active users in your Segment. Active users are those who have interacted with the Outbrain widget in the past 14 Days. Once you’ve saved your changes, you’re all set! Sit back and relax as our system optimizes your campaigns, reaching conversion-friendly audiences and reflecting in higher conversion rates over time. At any time – prior, during, or after your campaign – you can always reach out to our friendly Support team. The ideal segment size is 100,000 users. Make sure to not target your campaigns with a segment that’s too small in order to avoid scaling issues. Target up to 50 campaigns and exclude up to 100 campaigns per segment. If you are not receiving enough users, open up the URL to a broader term. 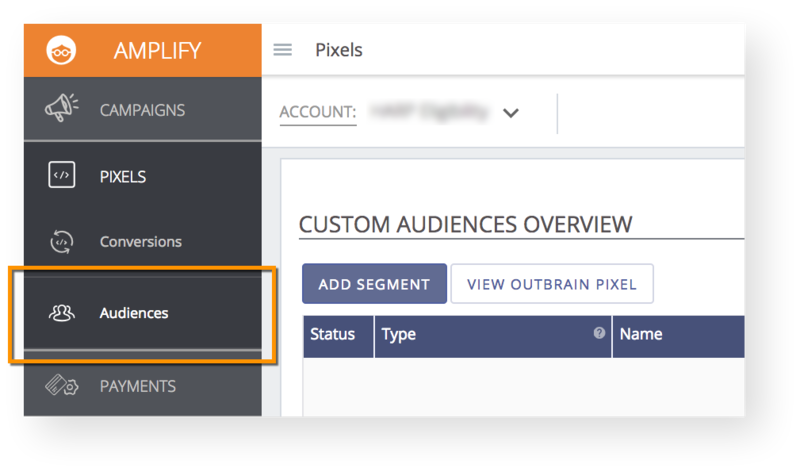 You can add multiple conditions per segment using the and/or options for the Audience Retargeting Collection Type. You can archive a segment by clicking the folder icon in the “Targeted Campaigns” column. Note that you will not be able to regenerate an archived segment. Segments cannot be archived when in use. You can create segments from App Store Lands by selecting the Converters Segment option. 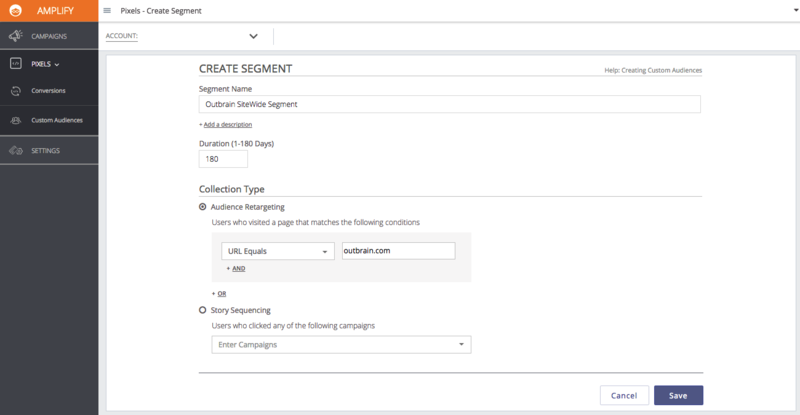 If a segment is not targeted to an active campaign or if it hasn’t been used for an extended period of time, it will stop populating with users and will be in the “Segment Not In Use” status. You can only have 1000 active segments per account. If you go over this amount, you’ll be unable to create a new segment until you archive an existing segment. How can I troubleshoot pixel installation?